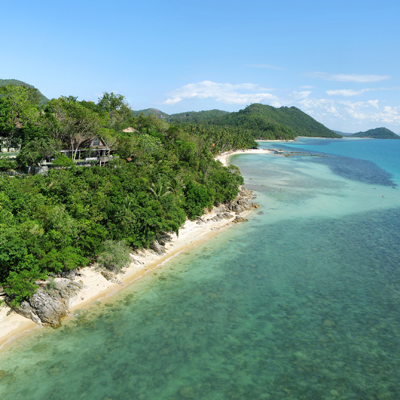 The Headland is located along the Baan Taling Ngam beach, on the unspoilt and most natural western coast of Koh Samui. There are days when you will want to simply enjoy the luxury, comfort and privacy of your villa or the beach at your footstep. 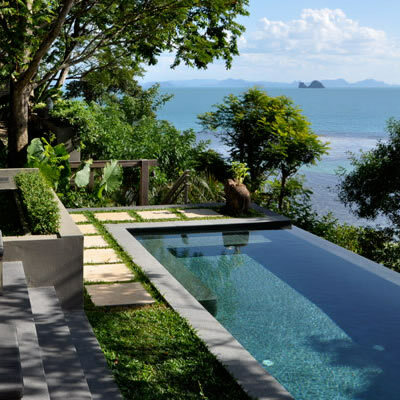 The beach is just below the villas, accessible by private staircase. For the days when you feel like venturing out, many activities are just a stroll away. Continental breakfast is prepared and served by the Villa Staff in the privacy of your villa every morning (included in rates); enjoy overlooking the turquoise waters. Home cooking: The kitchen is fully equipped for home cooking. Villa Staff can organize groceries unless you decide to take in the atmosphere of the colourful local markets in Nathon and barter for your fresh seafood, vegetables, fruits and spices; and there's always the convenience of a small Tesco Lotus supermarket there too. 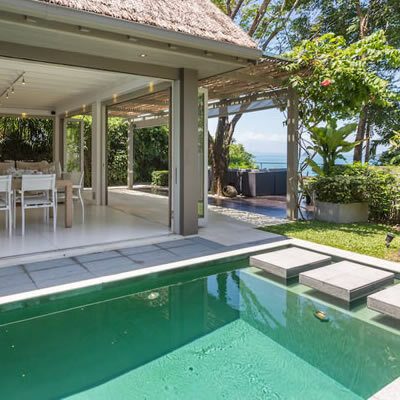 Experience a local chef: As a guest at the Headland Villas you will also be able to indulge in the fabulous flavours of Thailand, prepared by your own personal Chef. 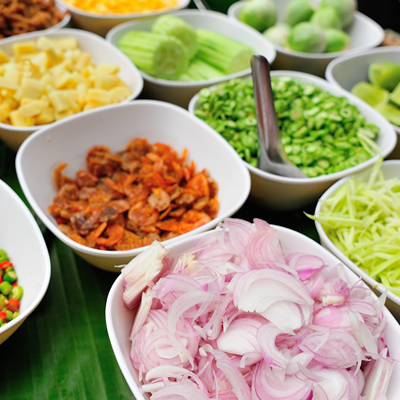 The staff can arrange for a Thai Chef (at a fee, full time or for specific meals), who is skilled in the art of local cuisine and specially trained to prepare the absolute best in healthy, authentic Thai food. Your Chef can also show you the secrets of their craft. After a few lessons, you will take home new skills that allow you to amaze your dinner guests with some delightful Thai creations - a lasting culinary experience. 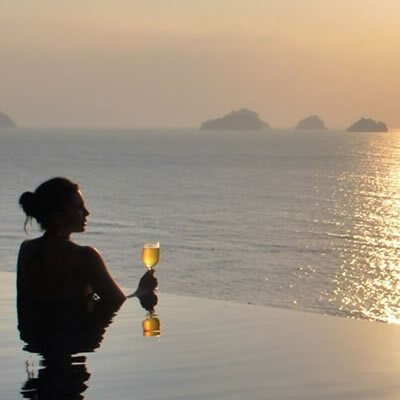 Highly recommended at sunset are sundowners at the The Intercontinental's Air-Bar, which not only proposes amazing cocktails (try the Chocolate Martini) but also offers breathtaking views from one of the highest vantage points on the Baan Taling Ngam coast and is blessed with some of the best sunsets on the island. 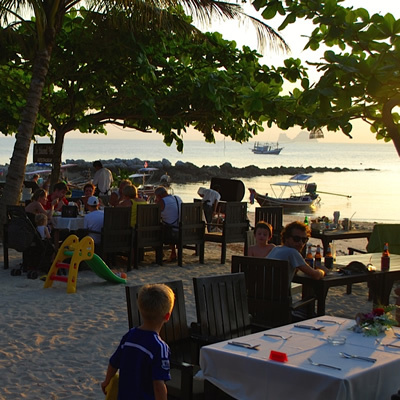 Only a 20-30 minute drive away are many fine dining restaurants located between Lamai and Chaweng. 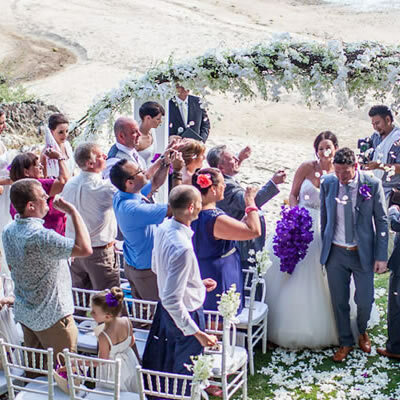 (Car/motorbike rentals or taxis can be arranged by Villa Staff), with a few closer options. 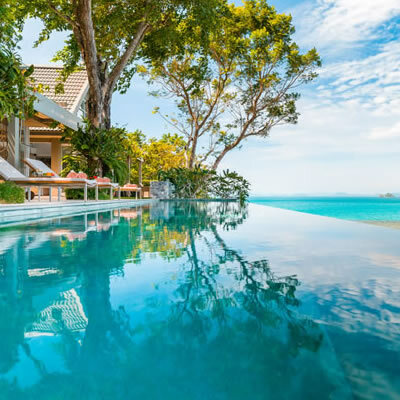 The beach, turquoise seas at your footstep: The white sand beach, shared with Intercontinental Hotel, is accessible through private stairs and complements perfectly your private infinity swimming pool. 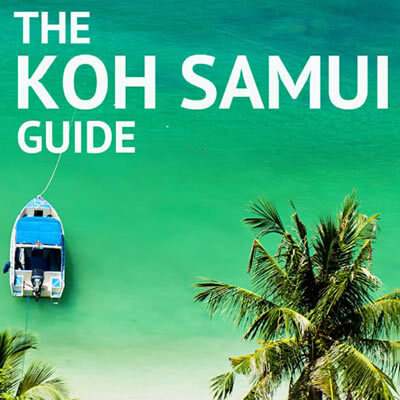 More secluded than crowded-Chaweng, Bhoput or Lamai, waters offer beautiful turquoise tones and beautiful views with generally calm seas and very small waves. While the seas can be quite shallow during low tide, a long jetty permits swimming and snorkeling at all times on top of nice evening walks. Snorkelling: Snorkelling can be done off the beach or from the jetty, a great fun activity on a clear visibility day with lots of corals and colourful fish. 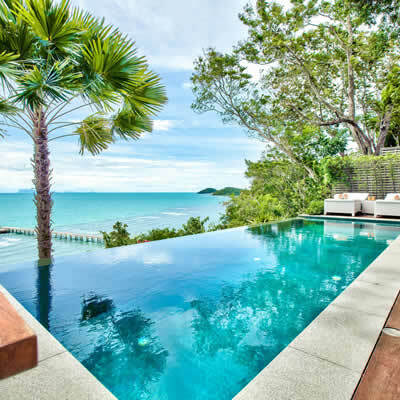 Alternatively, Villa Staff can arrange a boat from the nearby village; snorkelling excursions are a great way to see the beaches of Koh Samui in a different way. 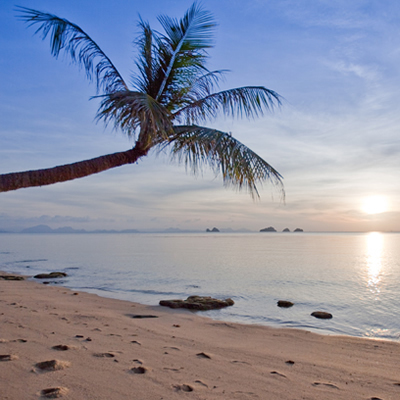 Nearby Koh Madsum and Koh Tan islands are renowned for good snorkeling. Angthong Marine National Park, a pristine gem: For a perfect day out, the renowned and pristine Angthong Marine National Park facing the villas offers an exotic adventure into a vibrant marine destination with soaring limestone mountains, an exotic jungle, white sand beaches, waterfalls and hidden lakes, including the source of inspiration for the novel "The Beach" which gave us the movie of the same name. 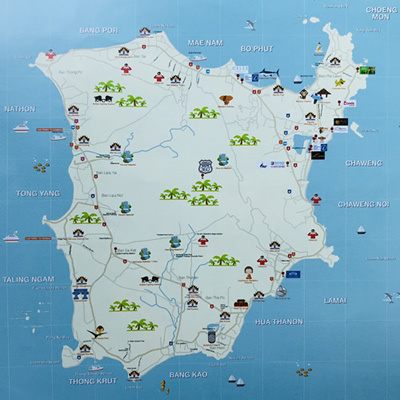 All trips to the Angthong Marine National Park departs in the morning from the nearby Nathon on the West Coast, a convenient 10-15 minutes drive away north from the Headland. 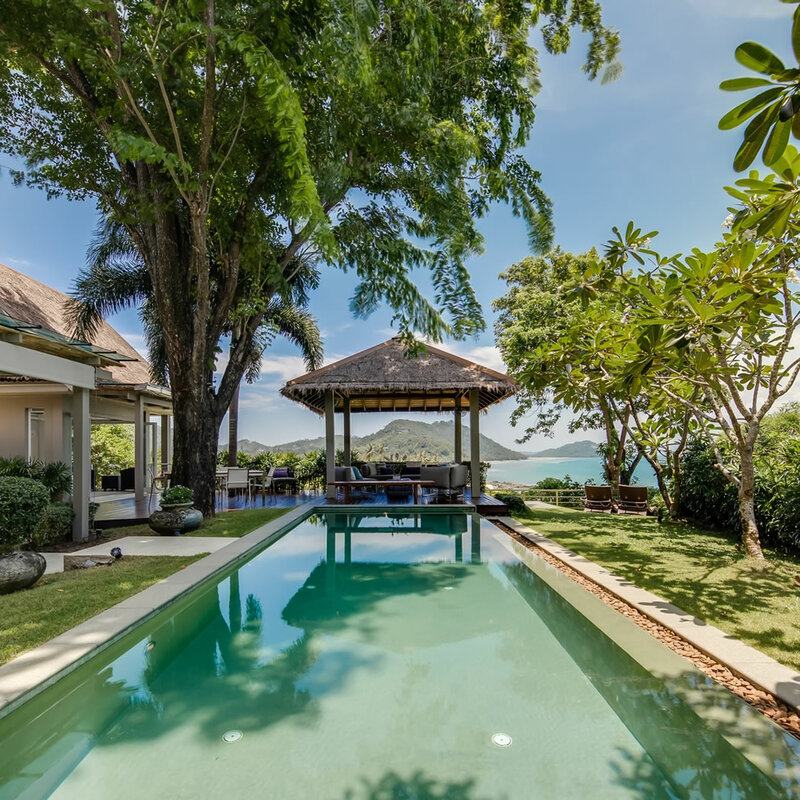 The Villa Manager can organise a long tail boat to pick you up on the beach in front of your Villa and tour around the Five Islands, typically combining a scenic trip, a swim in crystal clear waters and a fishing experience. We've never come back empty handed. The staff will be happy to turn your catch of the day into a tasty dish of sweet and sour fish to enjoy for dinner in the Villa when you return. 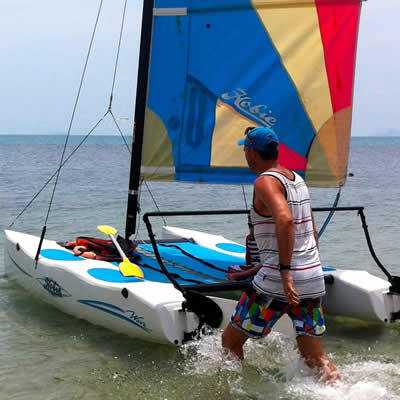 Hobie Cat or Windsurfing: At nominal rates, Headland guests are entitled to hire Hobie cats and windsurfs at the adjacent Intercontinental Hotel. Sea Kayaking: Another exciting way to explore the coast. Sea kayaks, along with paddleboards can be rented from adjacent Intercontinental Hotel. Paddle gently along the beaches or more sportily to the Five Islands. Kayaking is also available in Angthong Marine National Park, at Mae Koh. 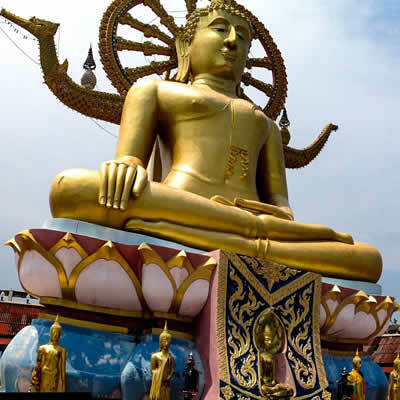 Diving: Diving day trips are available from Samui, the most famous sites being North of AngThong National Marine Park, around Koh Phangan and Koh Tao. A day's diving from Samui should get to two to three sites. We found this much more impressive than the Great Barrier Reef. Think National Geographic documentary. Rejuvenating traditional Thai massages by expert masseuses can be arranged by Villa Staff in the privacy of your villa at any time of the day. Mattresses can be installed in the comfort of your air-conditioned room or simply by the pool for you to enjoy the scenery and the smoothening sound of waves lapping along the beach. Manicures and pedicures can be arranged as well. Private Yoga sessions can be arranged at your villa, or you can join a morning session at the adjacent Intercontinental Hotel. 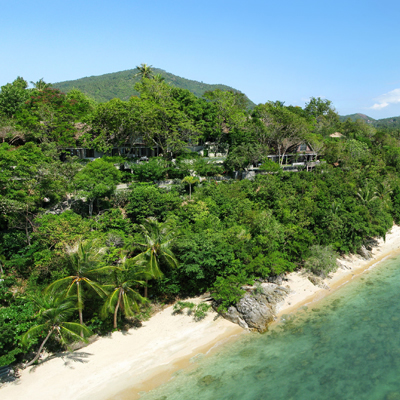 Kamalaya, a wellness sanctuary and holistic spa, also a 20-minutes drive away, in the South.